This quote comes from an article on the blog this art life. There is no name attached to the article and the blog has numerous authors, so regrettably i cannot acknowledge the authorship. The article has an unfortunate smug tone about it. It's not just the use of the royal plural throughout. It's mostly the attempt to gain some critical vantage over BW's work by constructing it as disappointingly dated 1960's hippy effluvia. Of The American Dream, "we began to feel freaked out, the way people in the 1960s used to get “freaked out”. It was a bad trip, man." Of Alchemy, "we cannot, however, escape the thought that the work is also horribly dated. Anyone who is sentimental for the mythic past of the 1960s should take a look at this picture to be reminded of the reality – although it was painted in the early 1970s, its hippy concepts are so overwhelming it’s hard to take it seriously." Negative, even catty, yes. But the writer(s) also seemed to be a person(s) of sensitivity to line and to painted surface. While their tastes and evaluations were not mine they conveyed a clarity of perception, a consistency of perspective, and a sensitivity to atmosphere enough to make me look and think again about Whiteley's work. Certainly enough to make me ponder again about my own response to the Brett Whiteley Studio which I had visited a decade or so ago. Brett’s studio and home are located in a building that formerly housed a T-shirt factory in Raper Street, Surry Hills, an inner-city suburb of Sydney. He bought it in 1985 and converted it into a studio and exhibition space. He lived in the factory from 1988 until his death in 1992. These pics (taken by Jac Bowie), are much as i remember the Studio from my own visit. So did i feel, like this author, that "What had troubled us was the deep and inescapable sense of sadness you feel inside the studio. Perhaps it was the ignominious junkie’s death, maybe it was the work that was in a serious state of decline in the last decade of his life."? I certainly understand what the author meant. Yes, i had the sense that i was walking through the shipwreck of a once proud galleon, now beached, with the tide gone out on its exposed ribs. Yes, i felt sadness hang in the air like stale incense. But that is not all i felt. For i also witnessed a drawing group in action there. Artists and aspiring artists were gathering around the remains to see if enough energy still wafted through the rooms to energise them too. Or perhaps it was they who were bringing their energy to lay on Brett's shrine. No, this was not a hippy enclave. It was not the 1970's pickled in a jar. It was a living enterprise. It contained aspiration and inspiration as much as it contained nostalgia and reverence. Our author concludes, "Eventually the sadness was too much to take and we vowed we would never again visit the Brett Whiteley Studio." But this is not my conclusion. 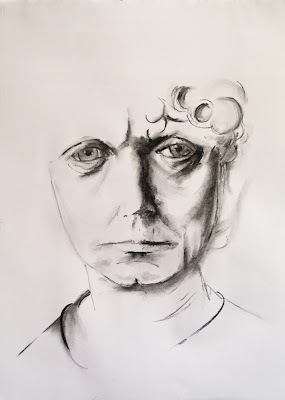 I will return soon, just to unpick the embroidery of my constructions of Brett Whiteley, man and myth, artist and icon. Meanwhile, i will press on with this series. A few more drawings searching for ideas (but i probably won't post any more of them) and then i'll start on the oil paintings. It may be some time before i post one of those. So a holiday for some weeks, gentle readers, from Brett Whiteley. Or rather, Harry Kent's scratchings and scribblings about an enigmatic artist who serves as a window into the enigmatic processes of the creative artist. Isn't that what happens when they setup shrines, the one remembered who was once real and vital fades away. Sad. But this is a great portrait that ironically does not fade. It stays in my mind's eye. I agree, Elizabeth. Shrines of rememberance are achey fingers clutching the past lest we forget. 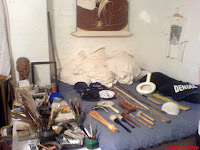 Is a shrine to an artist such a bad thing? We have them to soldiers and to shearers and to football legends. Why not an artist? Thanks for the nice comment on the drawing. I wanted to do something a bit more tonal, ephemeral, tender. Sir Isaac Newton said, "We stand on the shoulders of giants." Without a remembrance of giants, we have none upon whose shoulders we can stand. 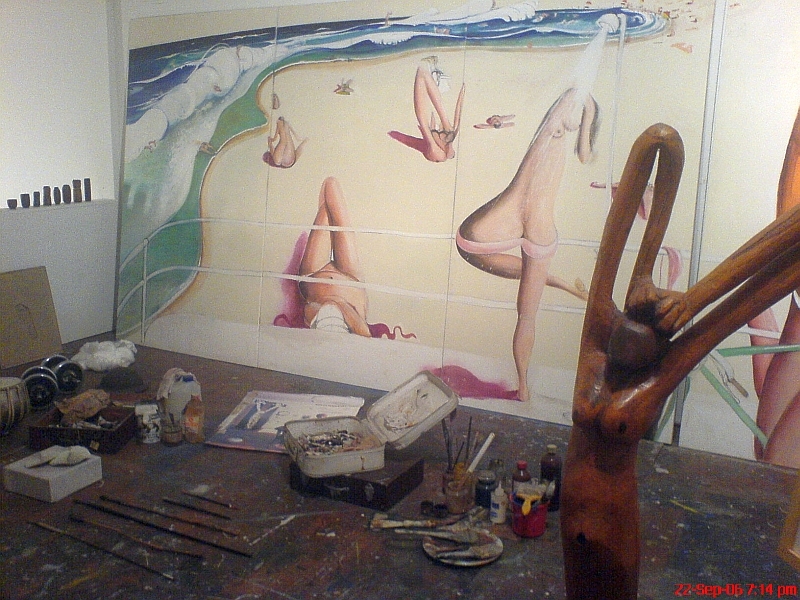 Preserving Whiteley's studio is a way to remember his artistic contribution. 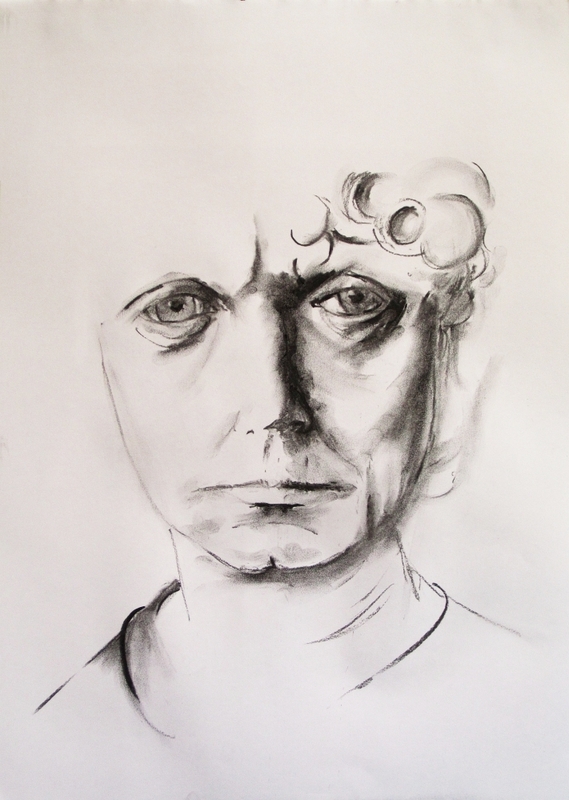 I remember that during the 60s being chastised for having the influence of any other artist in my work. If it was not absolutely original it was deemed worthless. Of course, that is foolishness. We all live in a particular time and space with a particular history. How can we deny our particular primordial soup and it's giants? Whitely is certainly among them. As for the sadness of the place,is that a product of knowing his end? You Harry have introduced me to him. If I had visited his studio without that introduction, would I have felt that sadness? What strikes me about the work of his I have seen is the lack of any superfluous mark making and the seeming ease with which he made it. There is nothing labored about his work. His internal struggles have not shown themselves to me in the work I have seen. As an artist, his shoulders are broad enough for those who wish to stand on them. So true, Davida - we swim in a soup of past artists. Imho, it is not that they have shown us how to see so much as showing us ways of extracting meaning from what we see. They provide a template we can lay over the visual field so as to organize in a particular way. Alberto Giacometti once said that "The object of art is not to reproduce reality, but to create a reality of the same intensity." Vincent, Munch, Picasso, Dali, Bacon, Whiteley create parallel universes that intersect with the daily reality we know to reveal its hidden truths. As for plagiarism, Whiteley was accused of the same. He spent quite some with Francis Bacon who became his mentor. Ever after, it became a cheap shot for a critic to say his work was derivative. Interesting question about the studio. Perhaps it is more projection than perception to see the sadness. Why critics have to be catty about anyone's work, i don't know. If you don't like it move on and find something else you do like. If you do like, stay to enjoy and give credit where credit is due. 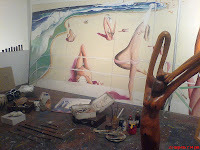 This morning I devoted the time necessary to read your post, "the art life" article and to visit the Brett Whiteley Studio (on the Art Gallery NSW website). Though I've been watching your portraits of Whiteley with interest, I knew nothing about him until I did this reading today. Thank you for introducing me to him! I agree with you about the article from "the art life"...smug is right! What I found almost comical was the word "we" used throughout. "we won't be back"...Cowards! Who were the authors who decided that Whiteley's Studio was sad and that his work was "dated"?...."we"! It's laughable. I note that the article was written in 2004 and that the blog became commercial with ads in 2010. One still has quite a time finding any author names on the new blog. Of course his studio is "sad"...the man died of a drug overdose...! But OMG I LOVE his work! Doesn't all work look like it originated from the time that it did???? Geez, whoever wrote that article is dense. ... By what authority does that person "criticize" Whiteley, who is no longer here and whose work very clearly indicates genius? Art critics like that are worthless! It appears that Whiteley left a wonderful legacy and that there are good people preserving it. My bet is that many of the young people who have taken classes there feel happy in the space (not "sad"). I'm happy, too, that you are devoting time and energy to this project that honors Whiteley. Your portrait of him is wonderful, and I enjoyed scrolling back to see the others. It is a fine series, "experimental"....and full of variety. Very fitting. Harry this has been a very interesting series dedicated to an artist I admit I know nothing about and am happy to learn of in this way. Isn't that part of what being part of this Blogosphere is about? This last one I like best - and not just because it signals a break in the series! I like how it is here and not here, eluding our grasp, as most artists do. I hope the new year is treating you well! Thanks for putting in the time to follow up BW, Celeste. And i couldn't agree more with your conclusions. That all art comes from a historical and cultural context is hardly news ... except when some critic is surprised by the fact and tries to make an issue of it. Whether my work would honor BW is in eye of the beholder, i guess. Yes, you're right - it's me experimenting, searching for iconic images tucked away somewhere in some dark recess of my head. These may or may not honor BW. My primary aim is to discover something about the creative process, using BW, his work and his thoughts on painting, as a 'way in'. And i grant myself complete liberty to use that material as a jumping off point for my own work, such as it is. What i am sure about is how pleasing it is that you have discovered BW's work and respond to it so enthusiastically. There are thousands of Aussies (our stingy critic excepted) who whole-heartedly agree with you. Hi Gabriella. So true. Isn't the blogsphere totally amazing! I have done a few more (these are but prelinary sketches searching for ideas) that i won't post for i fear everyone will be sick to death of this theme by the time i'm done. Well, at least it's a break from my self portraits! I've got the materials together for some wood cuts and lino cuts and am presently researching German Expressionist woodcuts from the 1890's, through to WWI and beyond, all the way to some contemporaries like Roy Lichtenstein and Dale Grimshaw. I have no idea what will result!